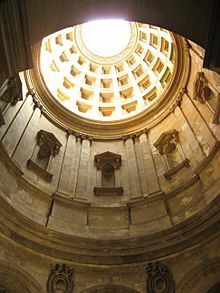 Hamilton Mausoleum is a mausoleum located in Hamilton, South Lanarkshire, Scotland. It was the resting place of the family of the Dukes of Hamilton. Built in the grounds of the now-demolished Hamilton Palace, its high stone used to hold the record for the longest echo within any man-made structure in the world, taking 15 seconds for the sound of a slammed door to fade. In 2014 the record was broken at the Inchindown oil storage tanks in the Scottish Highlands. In line with his grandiose enlargement of Hamilton Palace, Alexander, 10th Duke of Hamilton, replaced his family burial vault which stood close to the east quarter of the palace in the aisle of the old and dilapidated collegiate church. Now the solitary remaining testament to the colossal scale and grandeur of the buildings which once stood in Hamilton Low Parks, Hamilton Palace Mausoleum is a Roman-style domed structure of panelled masonry. Standing to an overall height of about 123 feet (37 m), it occupies a site some 650 feet (200 m) north of the site of Hamilton Palace. Construction was begun in 1842 by architect David Hamilton and completed by architects David Bryce and sculptor Alexander Handyside Ritchie in 1858, five years after the death of the 10th Duke. The Duke was interred in an Egyptian sarcophagus of the Ptolemaic period, on a black marble slab in the main chapel, while 17 of his ancestors were interred in the crypt below. The coffins of the 10th Duke and his ancestors were later removed after subsidence and flooding from the River Clyde affected the mausoleum, and were re-buried in Hamilton's Bent Cemetery in 1921. During the 1960s and 1970s the structure was observed to be subsiding, and a 20-foot (6-metre) plumb-line hanging on the front of the mausoleum indicated a lean from true verticality. The monolithic, plinth-based construction prevented structural cracking however, and, after many anxious years, the building settled back to near vertical (180 degrees). Inside the mausoleum are displayed the original bronze outer doors, featuring bas-relief work. The interior has one of the longest-lasting echo of any building in the world, a phenomenon dramatically demonstrated to visitors by slamming the entrance doors. Another curiosity of the interior architecture is the "Whispering Wa's" or walls. Two people can stand at either end of one of the curved interior walls, facing away from each other into the niche of the wall, and hold a whispered conversation. The remarkable acoustics of the walls project the sound to the listener at the other side. In the 1970s, the glass oculus in the dome was replaced with a perspex version, which was moved into position by helicopter. ^ a b c "Hamilton Mausoleum". Gazetteer for Scotland. Retrieved 2 December 2017. ^ Cox, T., 2014. Sonic wonderland: A scientific odyssey of sound. Random House.